In the past one of the objections to installing a VoIP system was the cost of rewiring the office. Today, a robust wireless infrastructure may to used to deploy the phone system. As with any network based phone system, it is critical to be able to implement a network that will assure high voice quality. Companies are finding the advantages in a secure high quality wireless network to drive down costs. Adopting wireless networks is a great way to reduce operating costs. Intel believes that cost savings can approach 80 percent compared to the cost of wired networks. Blue Chip works with many top level Wi-Fi manufacturers and can match your needs to their expertise. Our engineers provide the integration knowledge to deliver high quality uninterrupted voice streams to your phones, wired and WiFi devices. Historically, a company’s own IT department acquired, deployed, and maintained networking applications such as network management software. New applications and evolving use-cases often required the purchase of additional hardware such as servers. This leads to not only more capital expenditures, but also to increased support time that must be devoted by IT personnel. IT departments are already stretched while managing one central location, and when trying to deploy and maintain networking equipment and applications in distributed sites, the costs and support time needed by IT are compounded even further. Cloud networking introduces a new way to deploy, operate, and manage distributed enterprise networks. It delivers enterprise-class network capabilities via a cloud infrastructure that requires little or no capital investment in additional hardware appliances or IT resources. Unlike traditional hardware-based legacy solutions, cloud networking automates highly complex tasks to make them extremely simple. This enables enterprises to deploy locations in minutes and operate distributed networks with services delivered via a cloud infrastructure, while providing unprecedented levels of centralized control and network visibility. Cloud services are usually subscription-based as well, reducing any upfront capital costs. To fully test your 3CX, Blue Chip has arranged a 60 day trial Wi-Fi Access Point. You will be able to see how you can deploy the 3CX wirelessly and increase employee productivity. Sign up below! 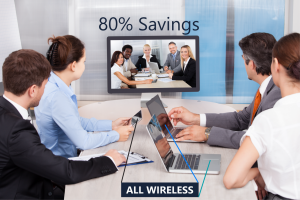 With all factors considered, total cost savings for installing and supporting a wireless network in an office can approach 80 percent when compared to the cost of installing and supporting a physical wired network, when amortized across an entire office.